Laugenbrötchen are German pretzel buns with a soft, chewy interior and thin, crisp crust. They’ll make an amazing sandwich or burger at your next family gathering! 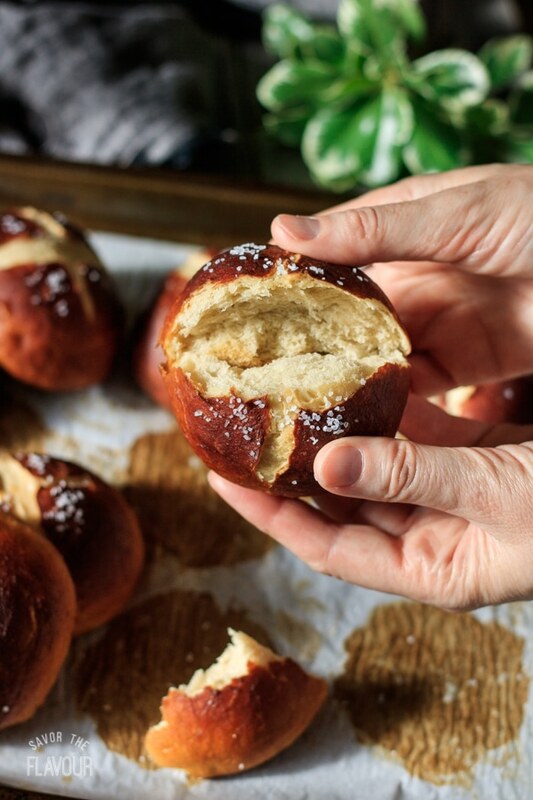 Learn how to make these chewy buns from scratch with your Kitchenaid mixer. Pretzels. The ultimate shopping mall snack, right? 😋 The amazing fragrance of these chewy morsels is enough to get even the busiest shoppers hungry for a taste. The warm, chewy dough topped with coarse-grained salt is simple, but oh so good. But you don’t have to go to the mall to satisfy a pretzel craving. 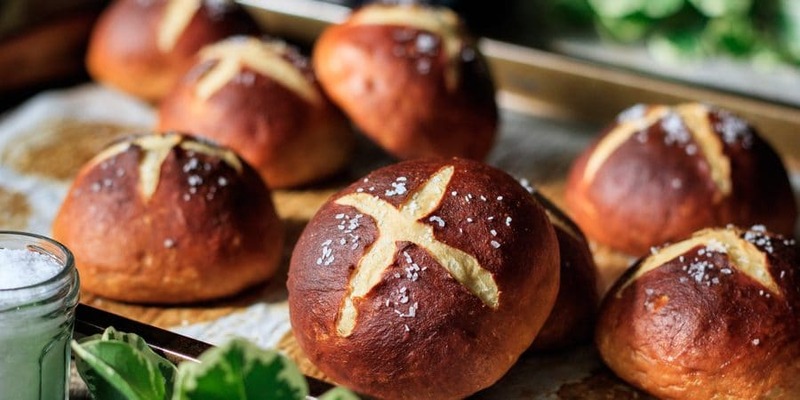 These delicious German-style pretzel buns are easy to make at home. Laugenbrötchen is the German name for these soft, chewy delights. Brötchen means “bun,” while laugen refers to an important part of the pretzel-making process. 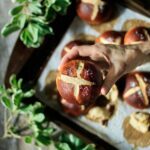 In order to get the distinctive deep brown crust, chewy texture, and unique flavor of a pretzel, German bakers traditionally immerse the pretzels in a solution of food-grade lye and water, called natronlauge. The German name for these buns literally means “lye bun!” Don’t worry, though, because I’ve opted for a safer and easier method: briefly poaching the unbaked rolls in a solution of baking soda and boiling water. It’s not as hard as it looks! Ready for pretzel bun fun? I’m up for it almost anytime. And you can use these homemade pretzel buns to make one of the most delicious hamburgers ever, right? 😍🍔 If you’re looking for an appetizer, rip the buns into pieces and dip them into pimento cheese. It’s an amazing snack you won’t soon forget! 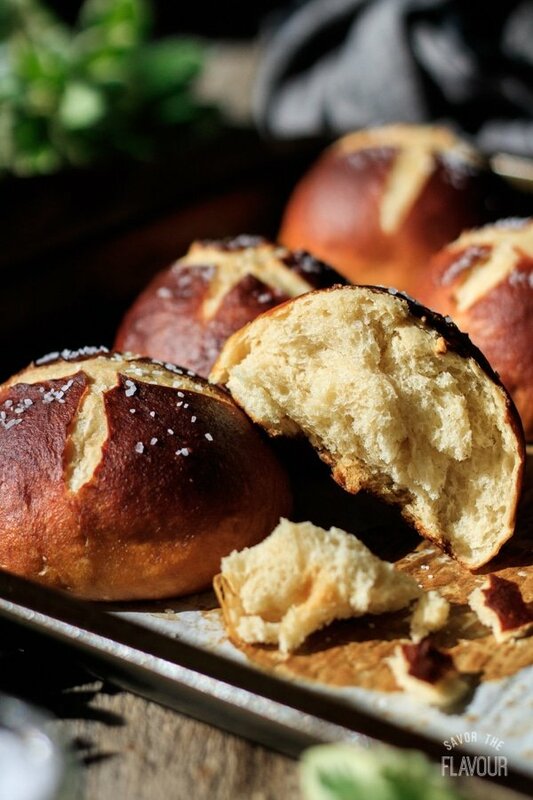 Serve these German pretzel buns with some other delicious food your family will love. 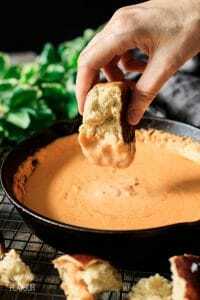 Homemade Southern Pimento Cheese Dip: this Southern classic can be served as a dip or spread. Easy Southern Cheese Straws: a crunchy, cheesy appetizer that’s a favorite of kids and adults alike. 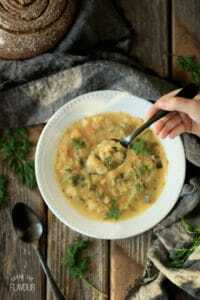 Dill Pickle Soup: dip a pretzel bun into this creamy, tangy soup for a fantastic treat. Stir together the milk and water, then warm the liquid to 115 F.
Pour the flour into the bowl of a stand mixer. Add the yeast and salt on opposite sides of the bowl and stir in each one with your hand. Make sure the salt and yeast don’t touch each other directly, as the salt can slow down the yeasts’ growth or even kill it. Dump in the softened butter and dark brown sugar. Using the paddle attachment, blend on the mixer’s lowest speed, constantly trickling in a thin stream of the milk mixture as the dough is mixed. Continue adding the liquid until a sticky dough has formed; you may not need all the liquid. Once the dough is blended, switch to a dough hook and knead on medium-low speed until the bowl comes clean. Most importantly, the dough should pass the windowpane test. Break off a large clump of dough and stretch it between the thumb and forefinger of each of your hands. The dough should stretch until it’s translucent in areas without breaking. If it breaks, knead for 30 seconds to a minute longer and check again. Shape the dough into a smooth ball, place in a buttered bowl, and cover tightly with plastic wrap. Let the dough prove at room temperature until doubled in size, about 1 hour. Line two 9 by 13-inch rimmed cookie sheets with parchment paper. Once the dough has doubled in size, turn it out onto a lightly floured surface and punch it down all over to knock out the gas pockets. Divide the dough into 12 equal pieces, using a kitchen scale for accuracy. Roll each piece into a taut ball and space the buns well apart on the two prepared trays. Place each tray inside of a clean garbage bag. Inflate the bag and tuck the ends under the tray to seal. Let the buns prove inside the bags for until the dough just barely springs back when gently prodded with a fingertip, about 30-45 minutes. Put both trays in the fridge for about 30 minutes to allow the dough to firm up some. Once the dough has proved, pour 10 cups (2.4 liters) of water into a large Dutch oven and bring to a boil. Gradually add the baking soda, stirring to dissolve. Don’t add the baking soda all at once, because it fizzes up when it hits the boiling water. Turn the heat down to a simmer. Slide a thin metal spatula under one of the buns and gently place the bun in the simmering water. Allow it to float on one side for 15 seconds, then flip it over carefully and let it poach for another 15 seconds. Gently remove the bun from the water with a slotted spatula and place on a large wooden cutting board. Repeat with the other 11 buns. Use a thin metal spatula to transfer the buns from the cutting board to the two parchment-lined cookie sheets. Slash each bun in a cross shape with a bread baker’s lame or a very sharp serrated knife. Sprinkle as desired with coarse-grained kosher salt. Bake at 400 F for 13-15 minutes, until the buns are a deep brown and have an internal temperature of 190 F. Allow the buns to cool for a minute or two on the trays, then peel the buns off the parchment and let them cool completely on a wire rack before serving. This dough is traditionally made with malt extract instead of dark brown sugar. German pretzel bakers would traditionally dip the pretzels in a mixture of food-grade lye and cool water instead of poaching them in a baking soda solution. Since most of us don’t have food-grade lye at home, I’ve opted for the baking soda alternative. Don’t skip the poaching, since this is what gives the pretzels their distinctive deep brown color, chewy texture, and wonderful flavor. It’s important to line the cookie sheets with parchment paper or a silicone baking mat since the baking soda solution on the pretzels can stain the metal trays and cause the pretzels to stick.